The new Storm 360GT Searchbait Weedless Jig Head has a thin wire guard that allows you to fish in and around weeds with ease. Exclusive VMC Coastal Black hook with an extended leg on the line tie further enhances action. 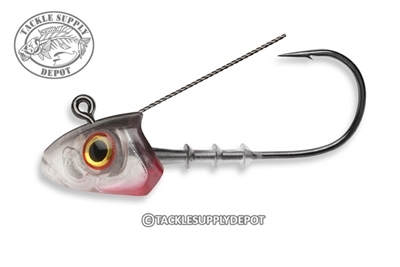 The 60 degree angle keeps the lure swimming in the perfect position. These life-like rattling jig heads fit precisely with the 360GT bodies for the ultimate package. The upscale color patterns perfectly match regional forage to work across country. Match the jig head to the body length intended for use for the ultimate package.